We had to much fun with our last mailbag, we figured we’d just have to do it again. The NCAA Tournament is our favorite time of the year, so we’re here to answer all your questions about Duke and March Madness. First, let’s take a look at a couple questions about Duke’s chances in the tournament this year. 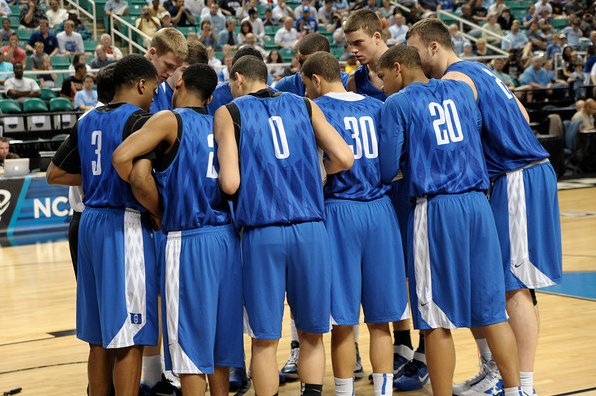 Our most honest assessment is that this is going to be a very tough road for Duke this year. The selection committee was not kind to the South region this year, which is by far the hardest of the four. This is particularly perplexing because the top seed in this year’s tournament, Kentucky, resides in the South. Typically the selection committee would seek to reward the top overall seed with the easiest road to the Final Four, but apparently this year that is not the case. The South region is stacked full of talented teams- other than Kentucky teams like Baylor and Indiana appear to be particularly dangerous. Luckily for Duke and Kentucky, two of the other biggest threats in this region, Wichita St. and UNLV both went down on Thursday. As for Duke, this is a team that came off of a difficult stretch late in the season. After the first round none of these games will be easy, regardless of their opponent. Our predictions for the South region had Duke advancing to the Elite 8 before falling to Kentucky, but to even get there will be a challenge. We hope that Duke will find its form and be able to accomplish this. Luckily for us, Duke has proven all year that it will play up or down to its competition, so having other tough teams in the region could actually be beneficial for the Blue Devils. Our predictions have Duke defeating #10 seed Xavier in the second round and #6 seed UNLV in the Sweet 16. We already know the latter will not be happening. There simply isn’t another team in this region that will be able to compete with Kentucky, unfortunately. They are too talented and Anthony Davis will give this team fits inside. We received quite a few questions about Duke forward Ryan Kelly and his availability. 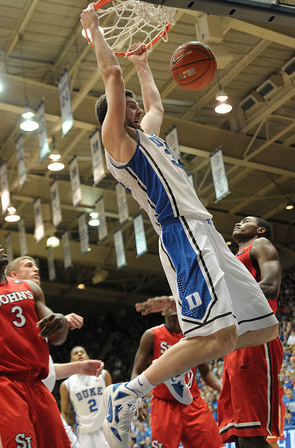 We learned yesterday that Ryan Kelly would not be available to play in Duke’s first round contest against Lehigh. His availability beyond then remains to be seen. Rumblings around campus have been that Kelly’s sprain was fairly severe, and it appears the team has been rushing to try and get him back on the court as soon as possible. I would say they will probably be cautious in doing so as to not jeopardize his ability to play later in the tournament and train during the offseason. At the moment, I would say that it is doubtful that you see very much of him this weekend, and if you do he will be far from 100%. As for Kelly’s importance to this Duke team, it is unquestionable. When Ryan Kelly plays well, this team wins basketball games. Duke is 17-1 in games where Ryan scores 10 points or more. It was clear that this team was missing something while playing without him in the ACC Tournament. Not only do they lack a big body that eats up space in the paint, they lose one of their better shooters and most versatile matchup problems. Let’s all hope for a speedy recovery, because it will be hard for Duke to be successful beyond the first weekend without Ryan Kelly. First thing’s first- Duke is going to have to make it to the Elite 8 to face Kentucky. But in order to make it to the Elite 8 and to knock off Kentucky, the Blue Devils will have to follow the same gameplan. First and foremost, they’ll need to shoot the lights out. They cannot afford to have a game where they don’t knock down their long range shots against any opponent in this region, let alone Kentucky. They will need to get the Plumlee brothers involved early and often inside. Throughout the season, the Miles and Mason have been Duke’s two most efficient options on the offensive end. But more than anything, this team will need to defend the hell out of any team they face, especially on the inside. They’ll need to lock down the opposing team’s big men- for Kentucky this would mean Anthony Davis- and crash the board relentlessly. If these two meet in the Elite 8 we’ll have many flashbacks about the greatest college basketball game ever played 20 years ago. But fact of the matter is, Duke was the more talented team in that game. This year, they won’t be, so there is a much slimmer margin for error when going up against a power like Kentucky. Unfortunately, to make a long story short, they will need to be nothing short of perfect. Amile Jefferson’s situation continues to be a mystery to us. It was our understanding that Amile would be prepared to make a decision this past weekend, but it appears he has chosen to wait a bit longer and weigh his options. This indicates that the competition for Amile between Duke and NC State is a bit closer than we originally thought. Our best guess is that he is waiting until the offseason to see whether certain players from Duke or NC State will decide to leave early and go pro before making his decision. It is unclear, however, whether that decision will be motivated by playing time or whether he is waiting to see if certain players he wants to play with will have left school before he arrives. Hopefully more on this situation becomes clear to us soon. As for Shabazz Muhammad, he continues to weigh his options. My gut feeling is that Duke’s chances to land Shabazz are fairly good, but only time will tell at this point. If this season has showed us anything, it’s that we need a player like him to come here. Well, it’s pretty easy. 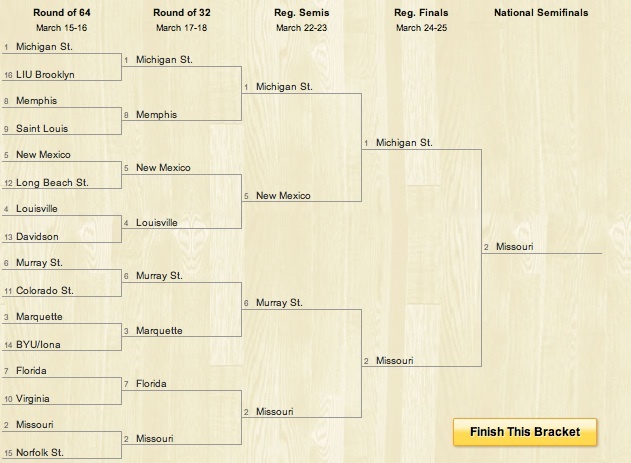 We picked Missouri to get to the Final Four in our preview of the West region. Although Haith’s reputation as a head coach is suspect due to his past endeavors, you’ve have to hand it to him and his team because Missouri is playing some fantastic basketball right now. Other than Michigan State, who many consider to be the weakest and most vulnerable of the #1 seeds, there isn’t much other competition in the West region for them to face. Other than that, it’s just a case of a hot team playing great ball. They’ve proven to be an offensive juggernaut, and we believe that will at least get them through one of the weaker regions in this year’s tournament. Great question. As for my most memorable Duke game, it would have to be Duke coming back from 22 points down in the Final Four against Maryland in 2001. I remember staying up late and watching that game with my parents when I was just nine years old. That was probably one of the most exciting basketball games of my childhood and really got me hooked on the NCAA Tournament. As for my most memorable non-Duke game, I’m going to have to go with the 2008 national championship game: Kansas 75, Memphis 68 in OT. That’s definitely one of the most underrated tournament games of the past decade, and Mario Chalmers’ 3-pointer to send the game into overtime is definitely one of the most underrated clutch shots ever hit. Derrick Rose showed glimpses of the brilliance we would watch in the NBA for years to come, but good triumphed over evil as John Calipari’s Memphis Tigers choked the game away with poor free throw shooting and ineligible SAT scores. Thanks to everyone for submitting some great questions. Hope you enjoyed the mailbag, and enjoy the basketball this weekend. This is the best weekend in sports. Obviously, the 8/9 game is intended to be between teams with parity; due to the closeness in seeding, victory in this game is less impressive than the potential of knocking off the #1 seed in the next round. I’m particularly intrigued by this game, though, because of the coaching matchup. Memphis is led by Josh Pastner, a young ingenue/madman who succeeded John Calipari when he left for Kentucky. 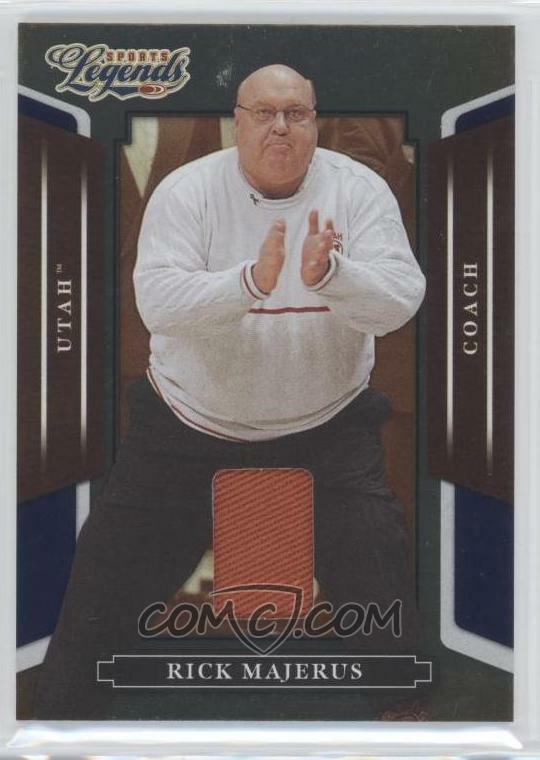 Saint Louis, on the other hand, is led by Rick Majerus, an old hand who has won 70% of his games, whose sweaters are the stuff of legend and whose Utah Utes took down UNC in the 1998 Final Four. It’s crazed fervor versus vintage stoicism, and the teams seem to be evenly matched. On paper, Memphis looks loads better: several 5 star recruits, including local legend Joe Jackson and star swing guard Will Barton. But the Tigers have struggled against big competition all year, losing early season matchups against Georgetown, Louisville and Murray State and dropping 3 games in the generally atrocious Conference USA. Saint Louis, though lacking the supposed star power of the Tigers, has balance and consistency–three players averaging in double figures–as well as defense, with the seventh best defensive rating in the NCAA allowing just 57.5 points per game. Ken Pomeroy has the Billikens at 15th in the country in his mathematically generated rankings (Memphis is 9th, though). Saint Louis finished second in the Atlantic 10, a vastly superior conference than the C-USA. It’s a clash of generations and a battle for Interstate 55 supremacy. Something tells me the youth and athleticism of Memphis will seize the day, but expect an exciting contest for the right to play (presumably) Michigan State. If I were Murray State, I’d be pissed with my seed. The Racers, one of four Kentucky universities to make the Dance (along with UK, Louisville and Western Kentucky), are 30-1 and beat tournament teams Memphis, St. Mary’s and the aforementioned WKU Hilltoppers during the season. Don’t fault their iffy strength of schedule, which is 239th out of 344 teams. Murray State’s top 5 scorers are upperclassmen with tournament experience, and they will come to the tourney with something to prove. We think they’re Sweet 16 bound and could present a problem for Missouri if they get there. Gordon is a former big name recruit, somewhat pursued by Duke, who has had a strange journey to stardom for the Lobos and Coach Steve Alford. He transferred from UCLA after two seasons, apparently due to discipline problems and disagreements with Coach Ben Howland (who apparently has had many personnel problems in the past few years). Gordon has thrived at New Mexico, averaging a double-double for his final two seasons. He averaged 15.3 points and 10.6 rebounds in the Mountain West tournament and led the Lobos to the title with big victories over UNLV and San Diego State, both of whom are dancing. Gordon–mature, poised and 6’9” 245 lbs.–could provide a spark for the Lobos. If they get past Long Beach State, the potential matchup with big, physical Louisville is tantalizing. I don’t foresee too many upsets in this region–in the first round, anyway. Some surprises might include Murray State to the Sweet 16 with a victory over Marquette and, if all goes well for Billy Donovan, Florida could ostensibly beat Mizzou. But it’s not likely–Missouri is primed to go to the Final Four. Having been snubbed by the selection committee after winning the Big XII title over Baylor, the Tigers got a favorable draw with this bracket. Michigan State is the weakest of the #1 seeds to me, although they are much better coached by Tom Izzo than Mizzou, who hired former Miami coach Frank Haith (how did he get that job?). The Tigers are loaded with seniors and physical guards. Ricardo Ratliffe matches up well with Spartan star forward Draymond Green. Kim English, a 6’6” guard who shoots nearly 50% from 3, is a matchup nightmare for anyone. The Tigers went 30-4; expect them to be 34-4 when the Final Four rolls around. Below are our complete picks. Let us know what you think in the comment box! Crazie-Talk's picks for the West Region. Don't hold us to 'em. Also, if you’re interesting in competing in our version of the Bracket Challenge, Gothic Madness, and competing against the fans of three other Duke sites, join Team Crazie Talk (#TeamCT). E-mail us at crazietalk@gmail.com or tweet at us @crazietalker to join. More details here. Thanks!